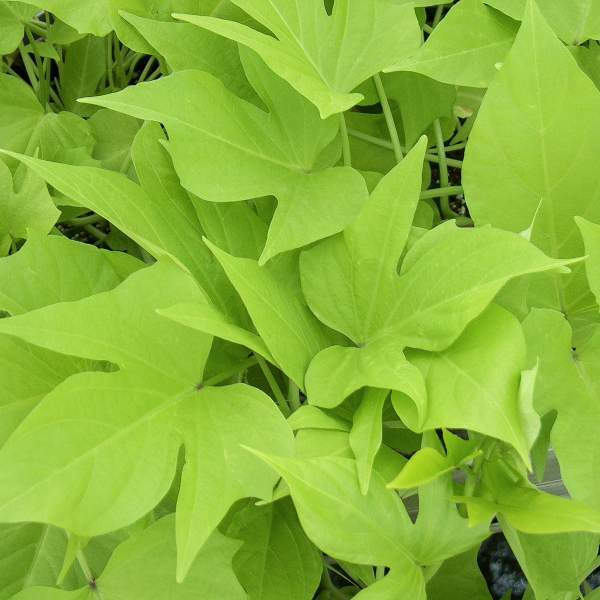 Originating in Polynesia, Ipomoea Sweet Potato vines are now a mainstay in U.S. landscaping. These fast-growing sun-lovers are best used as groundcovers, mixed container plants, and cascading elements in combination baskets. With strong, vigorous growth and beautiful runners, Ipomoea show off in any seasonal program. For best results with Ipomoea, we recommend using a low-but-constant feed program of 200 ppm N. Maintain a pH between 5.8 - 6.2 and an EC between 0.6 - 0.9. We recommend that you pinch Ipomoea 5-10 days after transplanting to your final container. Pinch these fast-growers frequently to maintain the plant’s shape for your final needs. Plant growth regulators are not necessary for Ipomoea. Aphids, whiteflies, thrips, and spider mites are the pests to watch for with Ipomoea. Ipomoea are not prone to many diseases, but watch for botrytis while the days are short. This grey rot is usually associated with wet or humid conditions. You can prevent botrytis by allowing the plant to dry out between waterings, allowing for good airflow in your greenhouse, and spacing to allow the sun to penetrate to the soil level. The most common chemicals used to treat botrytis are Medallion and Banrot. Use them as a drench according to each label’s instructions. We recommend planting 5 starter plants per 10 inch basket. Use a well-drained soil in your baskets and plant your starter plants deep, allowing the ellepot to be completely covered by the soil. If you are planting 4” pots, 2-3 plant per pot should be sufficient. When using three liners, plant them in a triangle in the middle of your pot.